Mining bees can play an important role by pollinating your plants and aerating your soil. However, too many bees may make you feel unsafe, especially if harmful species of bees or wasps begin moving into the tunnels. Look for these signs you have mining bees to learn when to contact a residential pest control company. As their name implies, mining or ground bees live in the ground. They leave tell-tale holes approximately 1/4 to 1/2 inch in diameter that are easy to spot once you know what to look for. You’ll probably find small mounds of dirt around these holes. 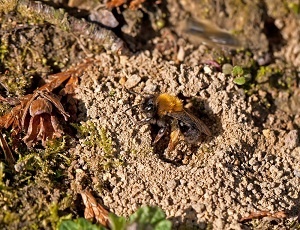 Although ground bees don’t live in communal hives, they tend to dig their holes fairly near each other, so you’ll probably see a dozen or more of these holes in close proximity. There are various types of bees and wasps that live in the ground--some more friendly than others. Wasps tend to be aggressive, and if you find that they’re the ones making holes in your yard, you’ll want to contact residential pest control services in Middletown, NY, right away. Other bees such as bumblebees are typically social, the same as most wasps. These are usually less aggressive than wasps, although they can be territorial if their nest is approached. You’ll know you have true ground bees by watching the holes--if you only see one or two bees coming and going, it’s probably a ground bee. Ground bees also tend to be smaller than other types of bees. Ground bees collect nectar and pollen just like other types of bees. This means you can find them near flowers and flowering trees. They prefer to dig their holes in dry soil and tend to stay away from anywhere that gets wet on a regular basis. You’ll first start to notice ground bee holes during the early spring. Bees are active during the day, so this is the best time to watch for them and see if they’re harmless ground bees or something more dangerous. Once the spring nesting season is over, the bees and their holes should disappear.